The debut winners keep coming for trainer Bob Baffert. This one certainly wasn't a well-kept secret. On Sunday, he sent out Godolphin's 3-year-old filly Flor de La Mar in Santa Anita's fifth race, a 6 1/2-furlong maiden special weight. The daughter of Tiznow crossed the wire first under wraps at 1-5 odds. The final time was 1:17.45. "This filly has really impressed us in the mornings," Baffert told XBTV before the race. "...When you look at her out there, she looks like a big Clydesdale galloping down the racetrack. But she's got this tremendous stride. What she's shown me so far, she could be the real deal." Flor de La Mar was bred in Kentucky by Don Alberto Corporation. Godolphin purchased her for $500,000 at the 2017 Fasig-Tiption Saratoga Select Yearling Sale. The dark bay filly is out of the Pulpit mare Sacristy, a Grade 3 winner who is also multiple Grade 2-placed. Baffert's other entrant Blue Moonrise led the way and set opening fractions of 22.24 and 45.82. Ron Ellis trainee Flat Out Joy was close in second, with Flor de La Mar pressing her. Jockey Joel Rosario asked Flor de La Mar to take over turning for home and the white-blazed filly responded. Blue Moonrise tried to come back on the rail but only managed second ahead of Flat Out Joy. Flor de La Mar was five lengths in front. Baffert also trains the 3-year-old colt Coliseum for Godolphin. The Tapit colt won by 6 3/4 lengths in a Nov. 17 maiden special weight at Del Mar. 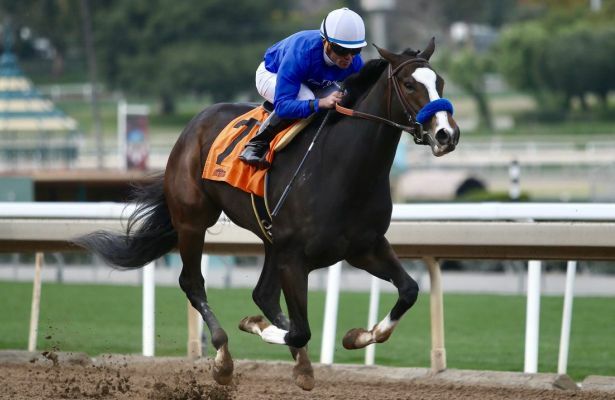 He returned in Santa Anita's Sham Stakes (G3) Jan. 5, part of the Kentucky Derby 2019 trail, and finished sixth as the favorite.